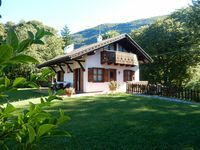 Property 8: Apartment "L'antico barn"
A very comfortable mountain property with beautiful vistas. A very enjoyable stay. Corrado was very friendly and accomodating and provided for a memorable experience for my friend and I in Northern Italy. We thoroughly enjoyed the peaceful setting and breathtaking mountain views. Wish we could have stayed longer! The property was great although a bit far from the center however it was quiet. The property was just what we needed with our 2 children. Enjoyed the terraces and the good layout. Had a good time!